‘Tis the season for giving! Stop in your local PDQ location listed below to spread the joy of giving this holiday season by donating a new, unwrapped children's toy. 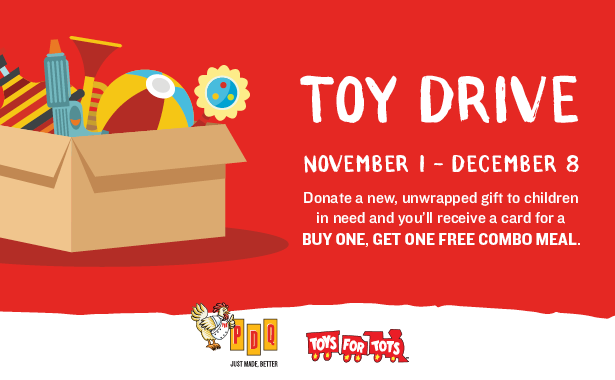 From November 1st to December 8th, PDQ is partnering up with Toys for Tots, a U. S. Marine Corps Reserve Program that collects toys to distribute to children in need throughout the local community. A Toys for Tots collection box will be displayed in each participating location and guests are encouraged to drop off new, unwrapped toys. In exchange for their generous donation, guests will receive a bounceback card valid for a Free Combo Meal with the purchase of a Combo Meal. "Our PDQ team is honored to work with Toys for Tots for this important community initiative,” said Amy Foley, PDQ Market Director. “This drive will impact many children in these areas and we are excited to work with others who are also People Dedicated to Quality." See below for a list of the participating PDQ locations.